Rosey and David’s stunning winter wedding reception was held at the historic Seibels House & Garden, after a memorable ceremony at Our Lady of the Hills church on December 15, 2019. Rosey was beautiful in her frosty white dress from Jo Lin’s Bridal and David looked sharp for the big day in his timeless tuxedo from Men’s Warehouse. The love between the two was undeniable on this special day! Wedding coordinator Brittany Buckner effortlessly brought the couple’s “evergreen winter” theme to life at the reception. The flickering lanterns, snowflakes, fresh greenery, and a dash of frosted blueberries and pinecones embellished the house and garden. Think Floral provided the greenery, as well as the bride’s stunning bouquet made up of white garden roses, white ranunculus, white lisianthus, dusty miller, faux blueberries, seeded eucalyptus, and small pinecones! This bouquet helped to tie the entire theme together. These holiday tones coordinated perfectly with the Seibels House’s neutral holiday décor. The historic house was a replica of a winter wonderland! In the garden, Something Borrowed provided a stunning clear tent with strung café lights. Guests mingled around the provided garden heaters and danced on the gorgeous wood dancefloor. 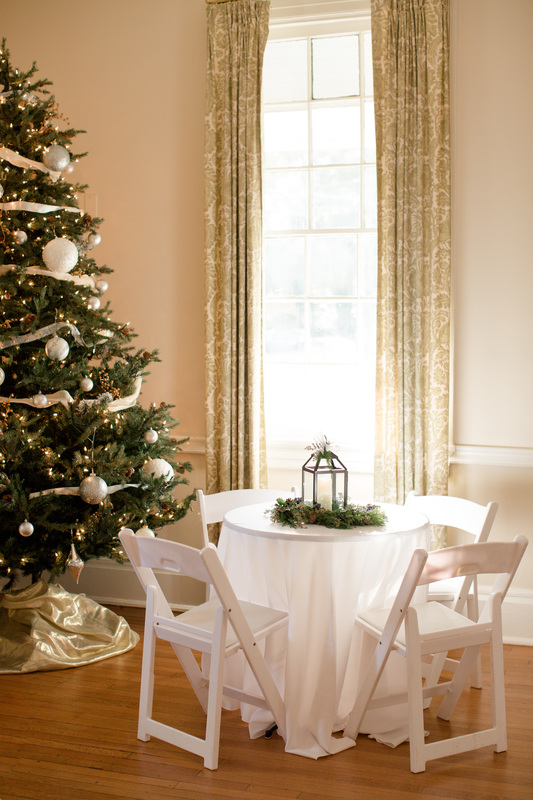 Their crisp, white linens helped pull together the winter theme. Children were also a very important part of this big day. Rosey’s now stepdaughter, Esme, was her maid of honor and looked stunning in her dusty blue dress alongside the other bridesmaids. There was also a fun table set up with games, toys, and even Play-Doh for the kids to enjoy! When it was time to eat, France’s Catering had everybody covered with delightful appetizers and entrees! There was also a large variety of beer, spirits, and wine served by Ed’s Bartending for the adults. It was a great time for all of the guests to chat and relax. Guests had a blast listening to the live band Not So Serious. It was a seriously fun time! Rosey honored her family’s New Orleans roots with a traditional New Orleans cake pull. In this tradition, single friends of the bride pull a ribbon out the base of the cake, revealing a silver charm. Each charm means something different about the woman’s life! What a special way to add a personal touch to the cake. And, of course, the multi-layer cake by Bonnie Brunt was gorgeous with hints of blue and a marbled base layer! The bottom tier was delicious sweet potato flavor. Guests crowded around to snag a piece. As the night came to the end, guests grabbed their adorable favor of mulled cider bags. Friends and family sent off the lovebirds with bio-degradable, faux “snow” and warm hugs. The couple was all smiles as they began their journey to forever. Photographer Cameron Haines captured magical pictures of the memorable event. See below for a full list of vendors.